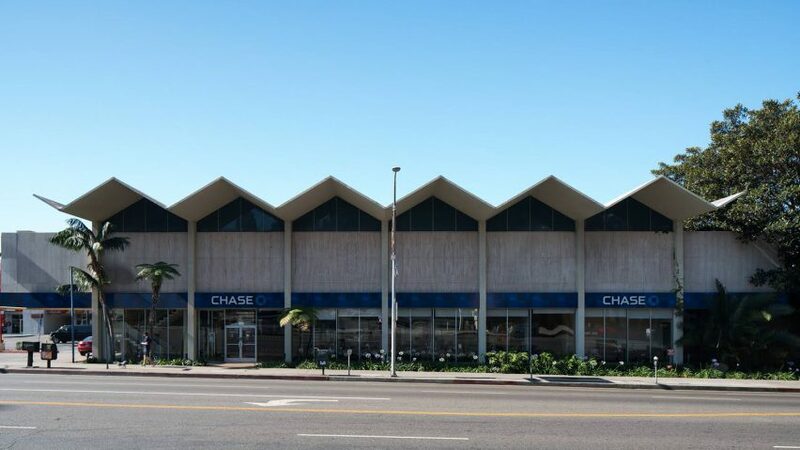 Los Angeles officials have approved plans to demolish a mid-century-modern bank by architect Kurt Meyer in order to build Frank Gehry's mixed-use complex on the city's Sunset Strip. LA's court of appeal gave Gehry's 8150 Sunset Boulevard project permission to raze the modernist Lytton Savings building on Friday 23 March 2018. Meyer's 20,000-square-foot (1,850-square-metre) bank on the corner of Sunset and Crescent Heights will therefore be bulldozed to make way for the complex of five interconnected buildings. The announcement comes despite opposition from preservations, who aimed to save the 1960 zig-zagged-roofed bank on the grounds of its architectural merit. The decision reverses a ruling ordered on 25 April 2017, which was backed by the Los Angeles Conservancy and stopped the city from providing permits for Gehry's 334,000 square feet (31,000 square metres) scheme to developers Townscape Partners unless alternative designs that include the structure were suggested. But Supreme Court judge Anthony Mohr has overturned this order after finding the solutions would not enable the project to reach its full potential, reports the Metropolitan News Enterprise. "The record contains a number of facts that constitute substantial evidence that the Preservation Alternatives would not fulfill the objectives of the Project, among which was a call for vibrant buildings that draw people in, create new economic opportunities, and preserve view corridors," said Mohr. "The City found several conditions preventing the Preservation Alternatives from achieving the visually appealing, pedestrian-oriented, economically viable new development described in the project objectives." Located at the eastern end of the Sunset Strip, and facing the Hollywood Hills to the north, Gehry's 8150 Sunset Boulevard will comprise five buildings linked by a common plaza at street level. It will include 249 residential units, with 15 per cent to be rented below market rate to low-income tenants, along with restaurants, stores and a host of public spaces. A new bank, a landscaped plaza and 800 parking spaces also feature in the scheme. Mohr added that one of the alternate schemes would "result in a disjointed design to sidewalks, project accessibility, and would not be as visually appealing or pedestrian friendly compared to the proposed project". Gehry – who placed at number 61 in the 2017 Dezeen Hot List – first unveiled the project in 2015, and received planning permission the following year. The locally based architect has fought much opposition to scheme. His firm Gehry Partners penning a letter to the city in 2016, asking that a request to protect the Lytton Savings building be ignored. Originally designed for American financier Bart Lytton, Swiss-born Meyer's building is currently occupied by Chase bank. It is regarded as the best-known project the late modernist architect completed in the city. It forms part of a series of architectural and cultural landmarks in the area, including the Chateau Marmont – a storied hotel meant to evoke a French estate opposite the site for Gehry's project – and the art deco-style Sunset Tower. The Lytton Savings building is among many architecturally impressive banks built in the USA during the mid 20th-century. Others include a branch based on Le Corbusier's Ronchamp chapel, and another fronted by tapered columns – both located in Palm Springs. Photography of Chase Bank/ Lytton Savings building is by Hunter Kerhart.